Hello and welcome to my 15th report as Voice. Time flies when you're having fun. 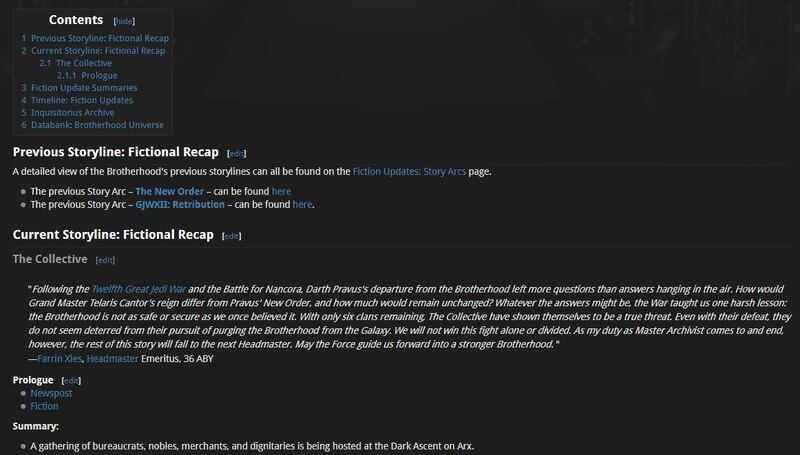 In case you missed it, the new story arc for the Brotherhood's main storyline has officially launched! Dubbed “The Collective” arc, you will see the [The Collective] tag accompanying the main plot updates for the foreseeable future. We went with this name to establish that the Collective are not a one-and-done adversary. They are a continual rival that challenges the existence of the Brotherhood. While this first Prologue doesn’t answer all of the questions you probably have, it serves as a strong base for handling some of the out-of-characters changes in the club from an in-character perspective. Namely, the transition from Pravus to Telaris as Grand Master. Read the full fiction here. When I use the term “Story Arc”, I am referring to how we’ve started segmenting the Brotherhood’s main storylines. 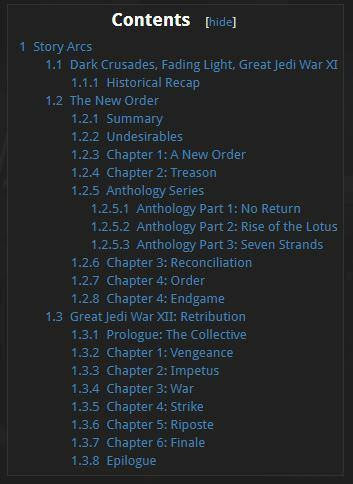 The goal with this was to make it easier for members to keep up with and track on both the current and previous storylines that are going on at the macro (main) level for plot updates. You can see the previous story arcs on the Fiction Updates: Story Arcs page. Special thanks to Alaris for updating the story arc table to include the latest arc and jump to 36 ABY. I’ve also updated the Fiction Center to reflect the new, current arc. This will track on the previous story arcs, while providing a landing page for future updates. All of your fiction updates and information will be kept in one place for ease of reference. These entries will feature a link to the newspost, the fiction, and a bullet-pointed summary. It came up in chat before, but I’m actually very open minded for Clans to mirror the formatting/angle I’ve taken with the Fiction Center. If you need help, or want to mirror any of our formatting/wiki coding, feel free to reach out to myself or Bentre. We’ve made two changes to the Character Sheet Administration. We’ve updated the Gender selection field to make more sense. The options you have now are: Male, Female, and Undefined. This selection impacts how the Character Sheet’s auto-coding generates text. This will appear in Aspects, Feats, and other backend database fields, and adds the option to have “they/their” in place of “his/her, he/she”. The Undefined selection applies as a bit of a catch all as well for alien species that fall outside male/female designation. As an added note: gender is separate from sexual identity. Hopefully this clarifies that, as a few members had some questions in this regard. Character sexuality, identity, and preference can all be covered under the wiki, or in Custom Aspects. This month was national pride month, so if you identify as a member of the LGBTQ+ community, I hope that the DB can continue to evolve and grow into a supportive organization that practices inclusion, not exclusion. We appreciate the patience as we update pre-existing coding and documentation, so thank you for continuing to be understanding and patient with us. Happy Pride. Aspects have been moved to “Step 7” in the Character Creation tool. This was done to help make the process flow a bit more logically to how you build a character. I often found myself skipping Aspects, filling out my Skills, Powers, and Feats, and then go back to write my Aspects. By moving Aspects to the last step, my hope is to encourage members to build their characters first, and then by the time they’ve done that, they can either pick their Aspects or start writing their own. I’m open to feedback on this, but confident that this move makes sense. After an all nighter and some work today, we've gone and updated the Character Creation Guide with a brand new coat of paint. I started with a mostly clean slate, and re-wrote a bunch of things that had been outdated, or things I'd written 3-4 years ago and didn't touch since they were technically okay. Special thanks to Atty for staying up late and helping keep me sane and checking my work. Huge special thank you to @Reiden4 for being my wiki-formatting hero and for giving me feedback and assisting with uploading the screenshots I took of the process. This is a huge contribution to something I classify as a Voice Project that impacts the club. The reason I had this marked as one of my marquee projects was that we wanted to make the guide useful to both brand new members, returning members, and even veterans. There is still some work to be done, but I believe this will be helpful going forward. Check out the Character Creation Guide here. Seraphol has replaced Farrin as the new Headmaster. I want to thank Farrin for all the help he’s rendered to me in my time as Voice. I can’t thank him enough for all his behind-the-scenes help during the War with grading and in general with being a great friend and ally. Sera and I have already begun talking about some fictional development there, so look out for that in the future. For now, check out a new exam we created based on the updated Character Creation Guide here. This exam was created to serve as a primer for new members that encourages the use of the Character Creation Guide. The guide has been tailored and designed to help members understand the Character Sheet Creation Tool, and covers how to get a Character Sheet approved. We have a few other ideas for helping new joins in creating their first sheets, but I believe that this exam will help, going forward, as a fundamental course. Atra and I have plans for a 201 course that would cover more in depth character development, builds, and how to write Custom Aspects. This exam pulls directly from the Character Creation Guide as “course notes”. I am a big fan of this, as to me, the more important element of SA exams is that you learn the material, so questions based on reading the context, while perhaps simple, should help highlight the information points we think are the most important. A lot of the questions address things that frequently come up in CS remands, so this might be something that helps even veteran members out. You can take a crack at the exam here. Let me know what you guys think. We’ve made a quick adjustment to the competition requirements. Duration and Timing- The minimum required run time for DJB wide fiction competitions is two weeks (14 days), with the recommended timeframe being two to three weeks (14-21 days). Competitions that try to run during a major Vendetta or Great Jedi War will also be remanded based on overlapping competition run time. In short, DB wide fiction competitions must be set to run for a minimum of two weeks (14 days). Competitions that try to run for shorter will be remanded. The Voice Staff Resources Hub has been renamed simply to Fiction Resources. This should make it easier to pull up quickly and reference, and will continue to serve as a hub/center for all information that pertains as relevant to the Fiction Society and its connected systems. I’ll be updating my project tracker this week. For now, please see the News section, which covers most of my project work. I will provide a mid-month update with future projects for you guys to check out. Mark asks: Is there any plan for Wiki pages for DC fleet assets, such as capital ships? There is. Currently there is just the Iron Forces wiki article. We have a new Order of Battle (OOB) outlined for the Dark Councils forces, and Arx’s defenses. It's on the DC project list to implement and then we will work on supporting the ships and forces with Wiki content and some NPCs. Kelly asks: How do you feel your re-stating of what the Inquisitorius is has helped people understand them as an organisation and is there anything you think you need to do to further clear up any lingering misunderstanding? I still think it will just take time to fix itself. I'll do what I can from my end, with some supplementary fictions to go along with the Main Plot Updates. Part of it is working on establishing what each Society does fictionally. So for example, Sera and I hopped into a Google Document to brainstorm a way for the SA Society to be more fictionally present. The Shroud is new and exciting, and Drac and I have previously worked on some GMRG updates. The INQ will fall naturally into their role as we move away from the initial “Witch Hunt” plot. Took a break from Star Wars to read some other science fiction/fantasy. I just finished Jim Butcher’s “Brief Cases”, a collection of short stories in the Dresden Files universe. Jim Butcher is one of my favorite authors, and I will continue to suggest him to anyone that wants to get better at writing combat. He is one of the best at describing clean, easy to follow action, and the magic system that Harry uses is based very strongly on concentration/will, which I think translates very well to how the Force works in our system. Butcher is also a huge Star Wars nerd, which tends to come out in moments throughout the series. Highly recommend checking out the Dresden Files if you haven’t already. Book 1 is Storm Front, and then you get 14 more following it. He is currently writing the 15th book, Peace Talks. If anyone is curious what I do as Voice, it’s a lot more than writing stories for the club. In fact, that’s honestly the smallest part of the job. I can write a fiction update in a few hours if I need to, at this point. What becomes more important is the collaborative element that we’ve baked into how we handle maco fiction updates. A lot of the other responsibilities come down to leadership and administration, being able to work with the other connected systems, being able to coordinate with other leads and organizers, evaluating, creating, and then re-evaluating policies on an ongoing basis, writing and rewriting technical documentation and guides to create better user experience, and in general fielding the harder questions and requests from members and balancing out what the best steps for the club. The other part that most members probably don’t realize is that I don’t get to do anything without running it through the Grand Master’s approval. The Voice is honestly stuck, usually, between a rock and a slightly larger rock. (Both hard places). They are the direct in-between for the GMs and the membership, which can lead to disagreements and arguments. At the end of the day, the Dark Council are here to improve the experience of members in our respective departments. You might not agree with it all the time, but that is the truth of it. We work directly for the GM to enforce the policies and directions they believe in. Me personally? I’m here to help, but I do not just do things based on whims. Everything I do has a reason, is supported by some kind of data, and I will always transparently outline and share those reasonings. That’s all for now. There is a lot of things going on right now, so pay attention to the main page and the main telegram chats. If you have questions, as usual, you know where to find me. Always good to get quality of life changes, and knowledge will always be power. Oh... and nice report! Haha. Glad to see the transparency into the work being done. Great updates here!